This blog post, with more to follow were made possible by the generous hospitality and chauffeuring of my good friend and her family during my recent short trip to Spain and Gibraltar. 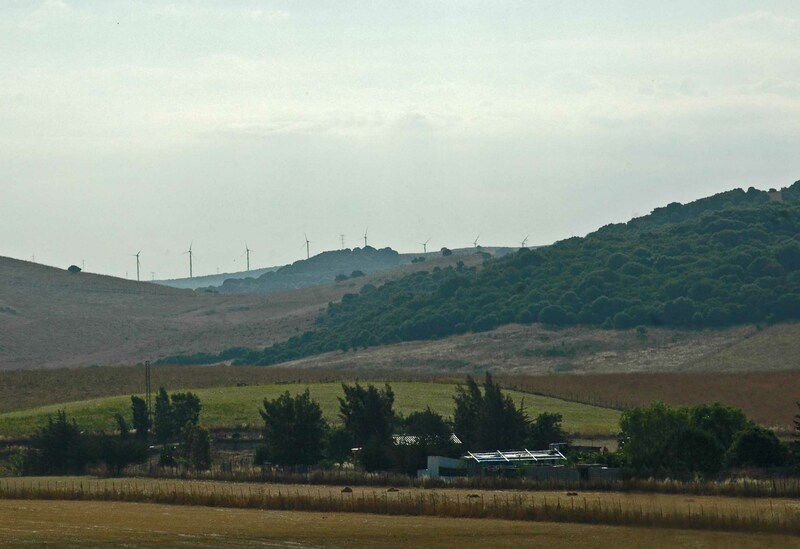 The family have a lovely weekend house out in the campo near Jimena de la Frontera and their garden combines with those of the neighbours’ to provide a bountiful summer oasis for a fascinating and varied array of wildlife, in an otherwise rapidly desiccating landscape. I have done a few blog posts based on this garden and its surroundings over the years and I was looking forward to seeing some familiar sights and interested to see if anything had changed since I’ve been gone. I am happy to report that a few short hours spent here brought back some very happy memories and was reassured that life was continuing here very much as when I had left it. 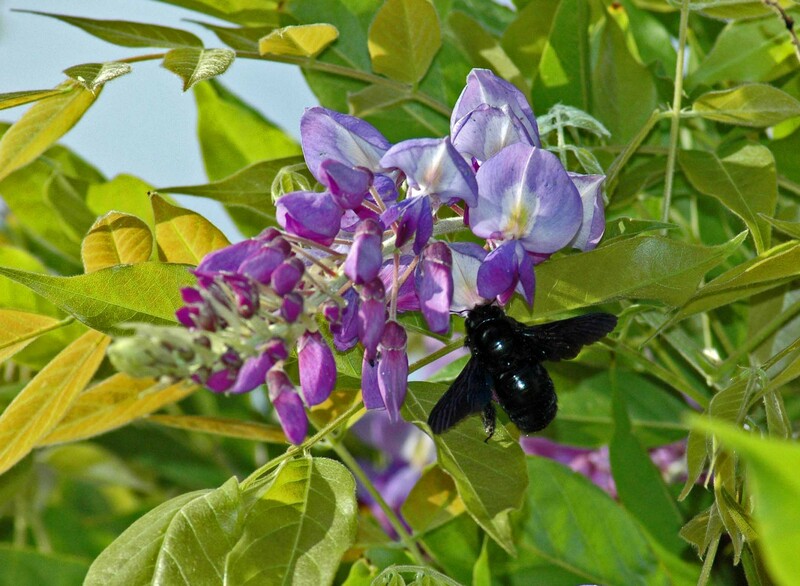 Yesterday afternoon I had sat and watched several Violet Carpenter Bees make frequent forays to nectar on the beautiful purple trusses of a wisteria which together with a grape vine, completely covers a sizeable pergola and shades the eating area of the patio at the back of the house. Not at all bad for a plant that began life here a few years ago as a rather unpromising twiggy offshoot, passed on from another gardening friend. This morning I sat outside with a cup of tea relishing the warm air and the peace of the surroundings, where for a while the only sounds were of a greenfinch calling and the cooing of Collared Doves. 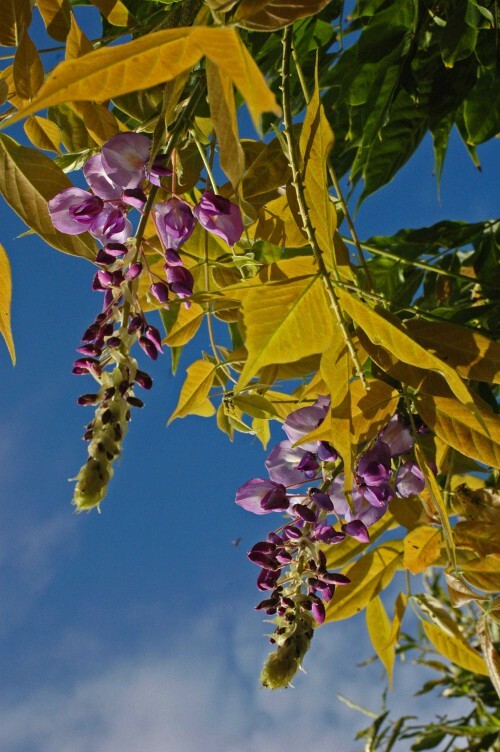 I was aware that the carpenter bees were already hard at work amongst the wisteria, but suddenly one of them left the wisteria and much to my surprise flew in front of me, landing on the ‘bee hotel’ located quite high up on the garden wall. I ran back inside to grab my camera, hoping the bee would still be there when I got back. She was and had just begun to investigate the hollow length of bamboo cane tucked into the top left-hand corner of the structure. 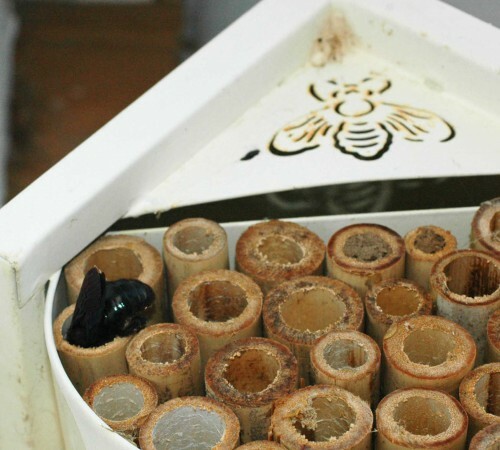 Violet Carpenter bee checking into the bee hotel. Perhaps it may not seem surprising that a bee should check in thus, after all, it’s what the structure was designed for and it’s clear on close inspection that other ‘rooms’ have already been occupied and sealed up. 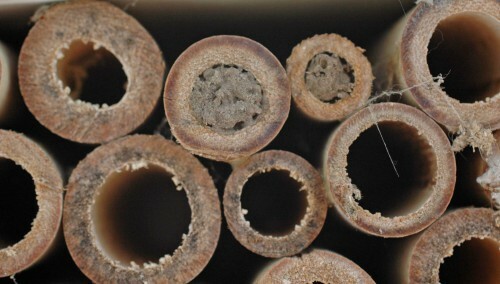 The surprise was more that Violet Carpenter bees are large, robust insects and the hollow bamboo canes are quite small in diameter and I would never have imagined one of their bulk able to fit in. I stood on a garden chair to get a better look at the bee’s activity and realised she had moved down to the tube below and was venturing inside it. With the benefit of the camera zoom, this one looks as though it may have been at least partially excavated and widened to fit: the wall appears thinner than those of neighbouring tubes and there is fresh ‘sawdust’ around the entrance. More specks on the bees’s body could mean she is still working on it. I felt a little fearful for the bee. 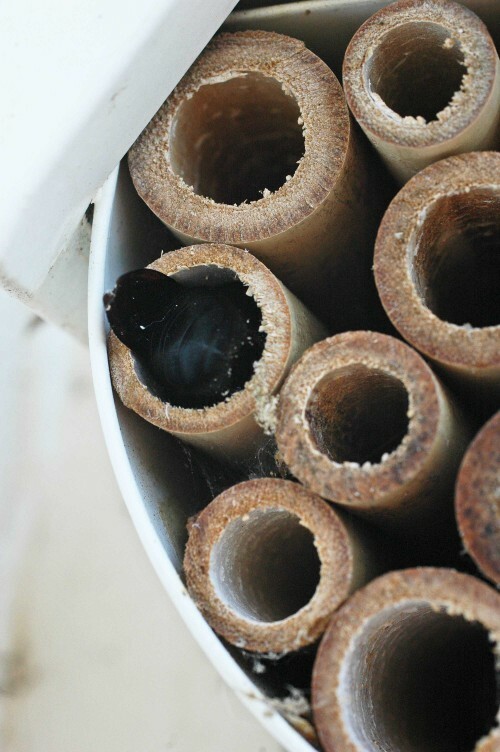 I know they are ‘carpenter’ bees and chomping through wood to nest is what they do, but what if she got stuck in the tiny space and couldn’t get out? Does that happen I wonder? And how does the egg-laying work? Presumably she needs either to be able to turn herself around in there or come out backwards and reverse in to lay eggs? Sadly I only have one day here, so further observation is not possible this time. I am hoping for updates though. I’d love to know what has occupied and sealed up some of the other ‘rooms’ too; surely something smaller than a Violet Carpenter bee? 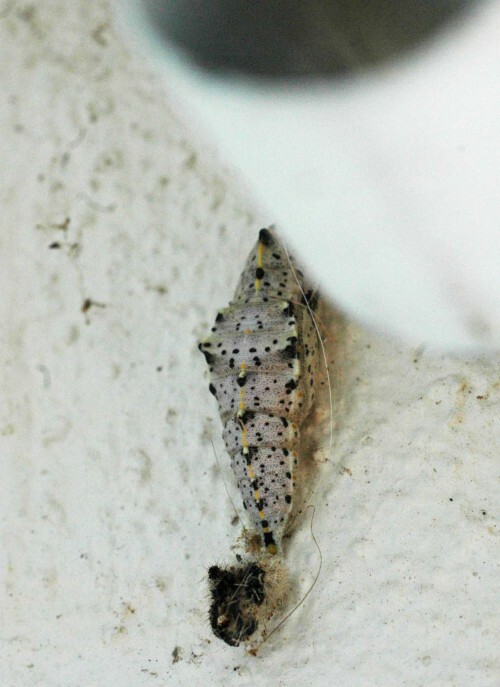 Just below the bee hotel, attached to the wall is a pupa of a Small White butterfly. Early on I watched a flock of Griffon Vultures circling in the distance, gradually disappearing from sight as they wheeled around searching for thermal currents to carry them up and away. 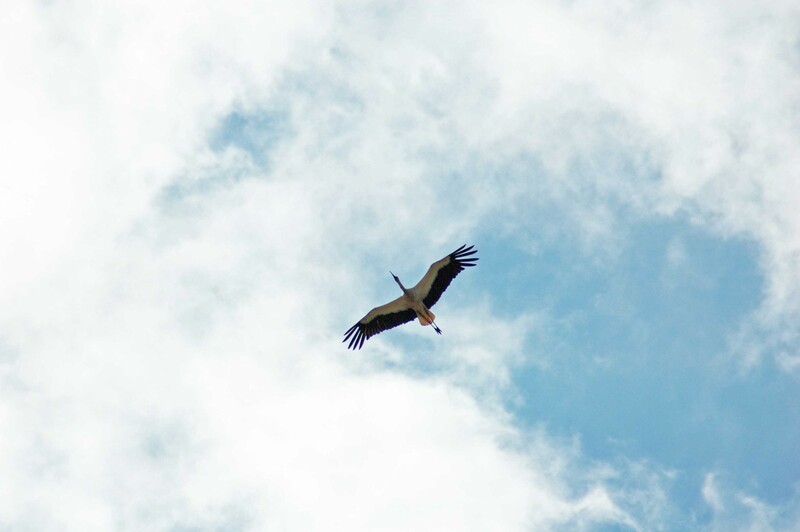 I has a better view of a White Stork that circled above the garden, but it was still quite high up. 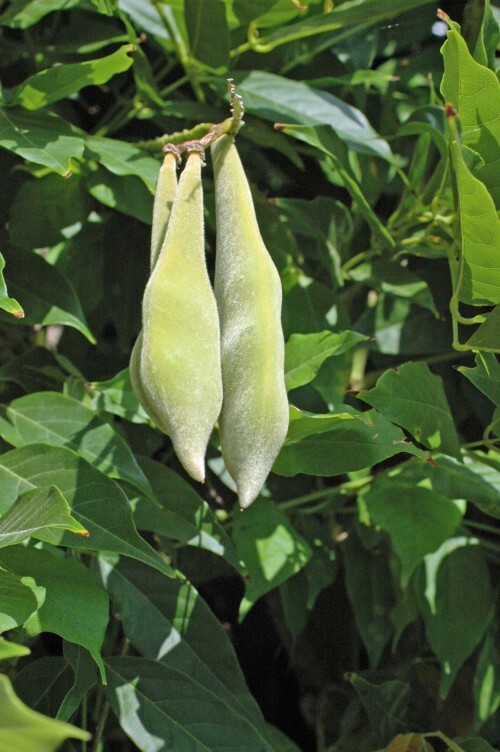 The wisteria is past its best now and some of the flowers have already transformed into seed pods. 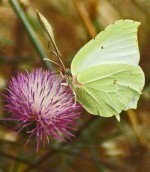 The flowers remaining are being worked hard; a host of insects, including aphids are feasting whilst the going is good. Soon heat and drought will bake the countryside and flowers will be scarce. 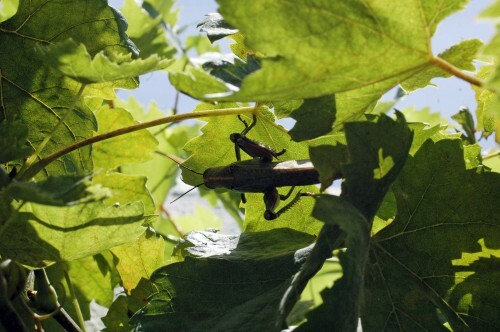 Underneath the vine leaves a well-camouflaged Egyptian Grasshopper was munching his way through leaves from underneath, hanging on upside down. 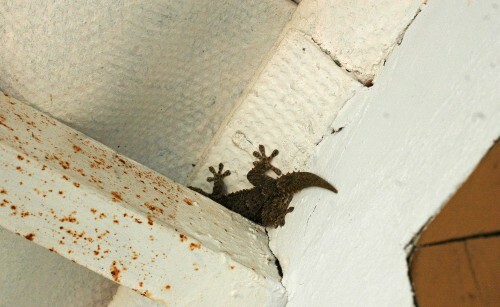 Later on it either fell or dropped down onto the patio beneath; maybe he ate too much of the leaf and lost his grip. 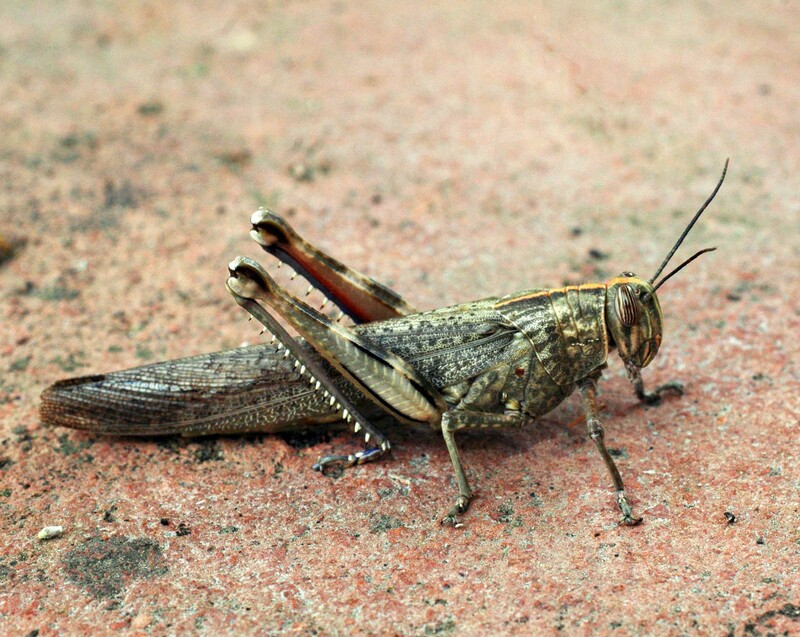 What a handsome insect. The vine leaves were under attack from another angle too. Lower down was a large fat Elephant Hawk moth caterpillar gripping on with its short little legs wrapped entirely around a twiggy stem. 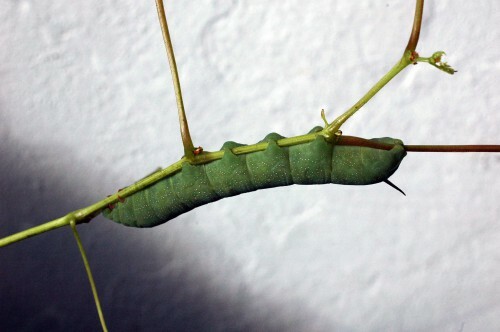 Like most hawk moth caterpillars, they have a backward curving spine or “horn” on the final abdominal segment. 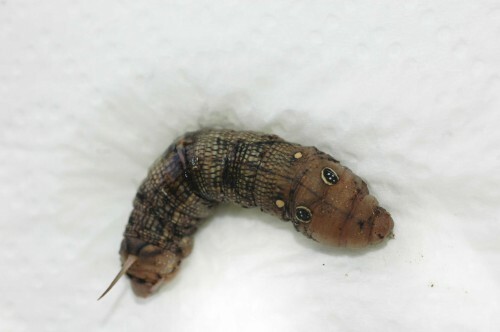 The head end of the caterpillar appears to have the shape of a trunk-like snout. 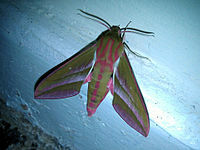 It is this elephant look, rather than its large size, that gives the moth its name. 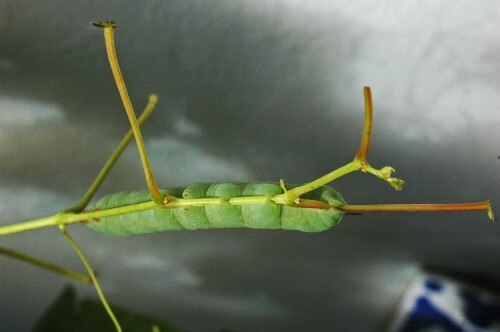 When the caterpillar is startled, it draws its trunk into its foremost body segment. In this pose it then resembles a snake with a large head and four large eye-like patches. The caterpillars are preyed upon by birds, but they may be put off by those taking up a “snake” pose, although it is not known whether the birds actually regard the caterpillar as a snake, or are more taken aback by the sudden change of a familiar prey item into an unusual and boldly-patterned shape. 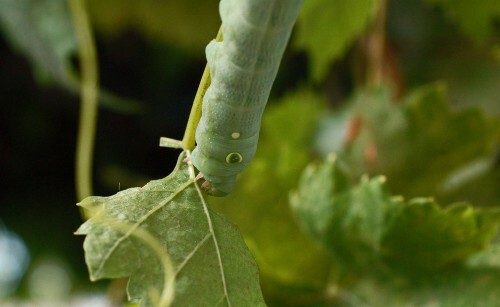 We left the caterpillar chomping through a vine leaf, although with some trepidation. We feared that should it venture down the ground to pupate, which seemed a possibility as it was already sizeable and low down in the vine, that it would become prey for some of the ants that seem to be everywhere. We looked for him the next day and were sad to see our fears had manifested. The poor caterpillar was indeed on the ground and had ants swarming all over it. At first we thought it was already dead, but ‘rescued’ it anyway. 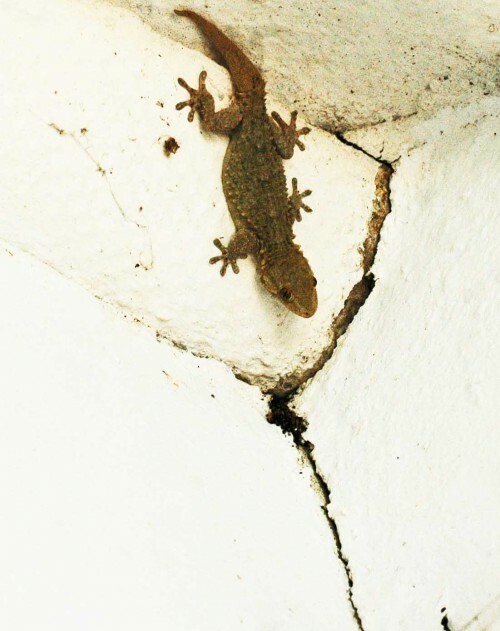 There are resident geckos here, some very large ones that are probably a few years old; geckos can live up to 8-9 years. They spend much of the day hiding away in the shade but emerge occasionally. 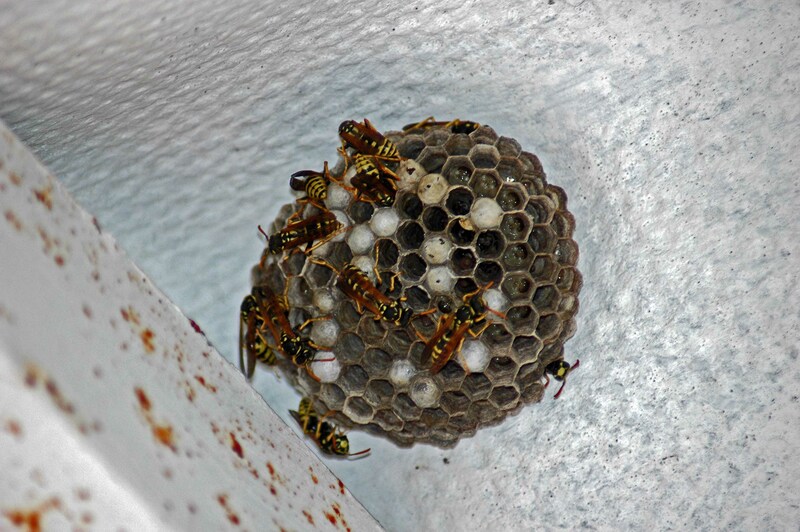 There are a couple of paper wasp nests suspended from the shaded ceilings of the outdoor covered areas. 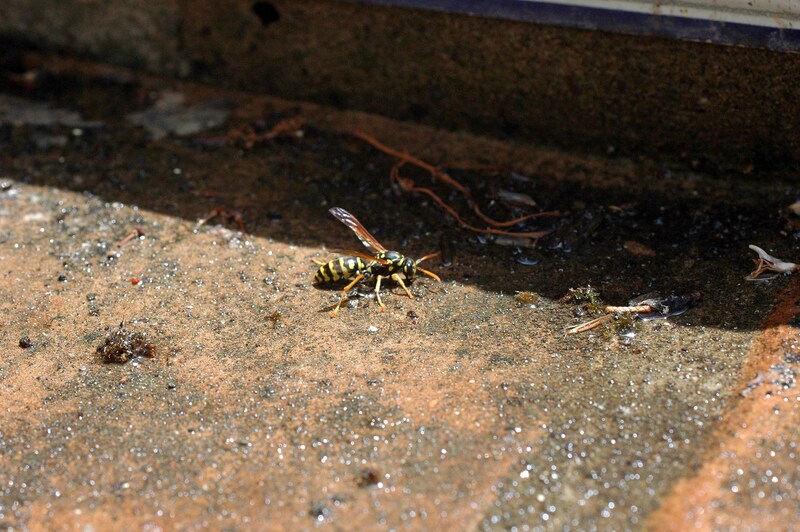 These are not the common wasps that are attracted to outdoor tables in search of easy food. 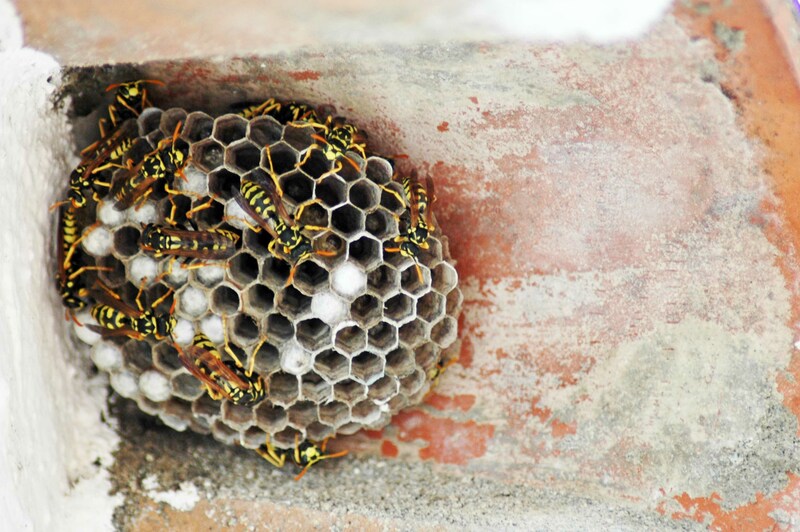 Known as the European Paper Wasp these are social wasps of the ‘polistes‘ species, probably polistes dominulus. The nests are made of chewed-up wood and saliva and are beautifully made. 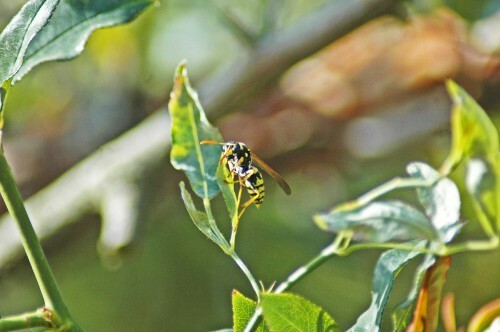 The wasps hunt and eat a variety of insects. There were a few butterflies about, a number of Small Whites and high on the wisteria, some small blue ones, probably Long-tailed Blues. 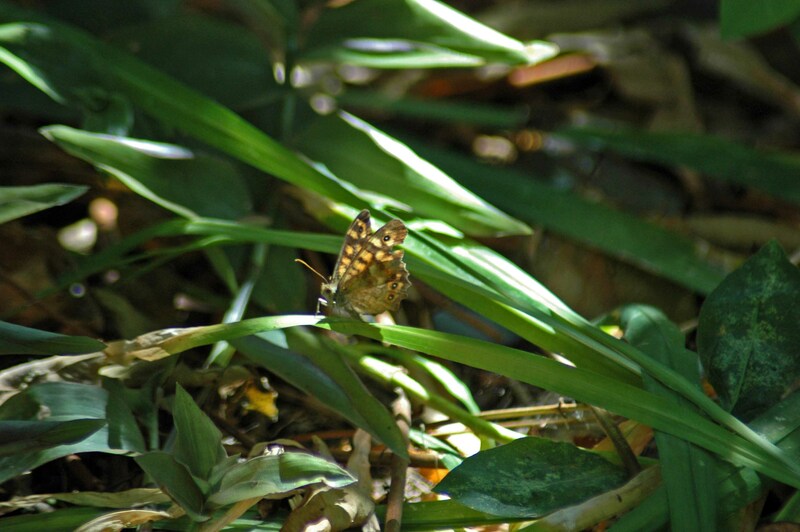 In the shade under the citrus trees was a Speckled Wood, looking a bit tattered, resting in a tiny patch of sunlight. 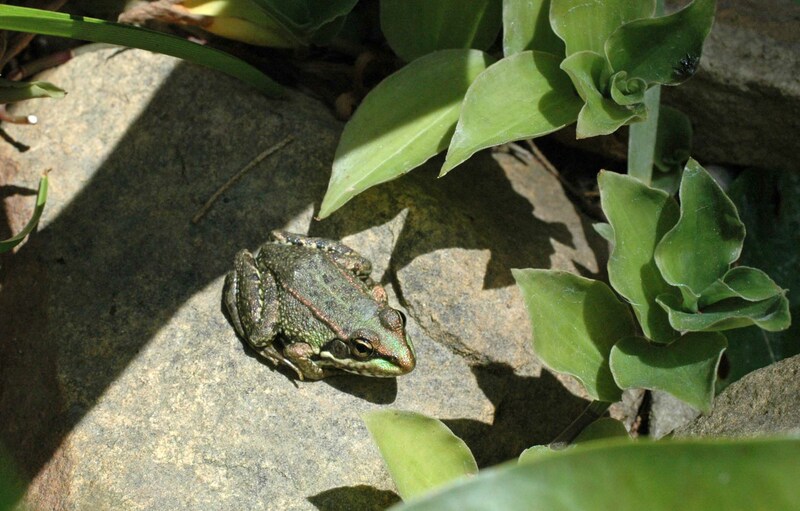 And a little frog who came out of the little pond to sit on a rock and sunbathe. 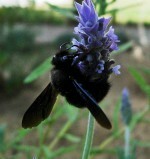 This entry was posted in Insects of Southern Spain, Nature of Southern Spain, Nature Photography, Uncategorized, Wildlife of Cadíz and tagged egyptian grasshopper, elephant hawk-moth caterpillar, large black bee in Spain, Moorish Gecko, paper wasps, polistes dominula, Violet Carpenter Bee, wisteria. Bookmark the permalink. I am kiayi, a year 4 undergraduate from the National University of Singapore. 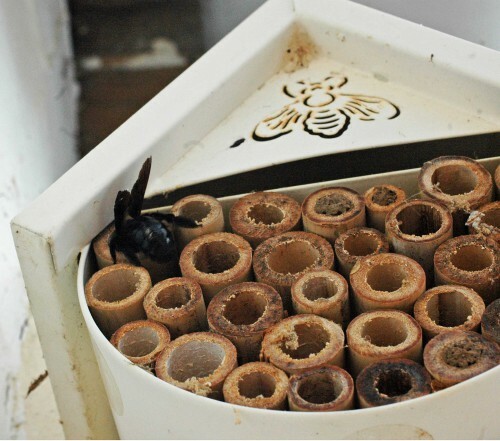 I am doing up a species page for Xylocopa aestuans and came across the beautiful picture of your bee hotel. I was wondering if I could get your permission to use the picture on the site. With due credits of course. Such beautiful nature photography, particularly the carpenter bee checking out its new home. I hope autumn and winter have been as good and looking forward to more nature posts on your blog in the new year. Have a happy holidays!